The Burghfield wing of the Atomic Weapons Establishment (AWE) in Berkshire has seen its biggest protest in years, with the three road entrances to the site blocked for nearly five hours the morning of June 9 in a blockade organised by Trident Ploughshares as part of the ongoing ActionAWE grassroots campaign dedicated to halting nuclear weapons production at the Atomic Weapons Establishment. Opponents of the Trident nuclear weapons system locked themselves to cars and to each other to prevent traffic entering the site to carry out construction work. Although there have been protests at the site in the past, this is the first time that an unannounced protest has blocked access via all three roads. Protests at the site have escalated in recent months, as Britain gets closer to a general election that could determine the future of Trident. Two people were arrested as police forcibly cleared one of the entrances at around 11.00 a.m. The blockade began just before 7.00 a.m. and finished around noon. Twenty-nine people were involved. About a third were from Wales, with others from Reading, Bradford, Cornwall, London, Norfolk and elsewhere. The oldest participant was 82. And Labour MP Jeremy Corbyn took to Twitter during the morning to declare his support for the protest. The construction work at the site, where aspects of Trident are developed, is due to a government gift of £2bn to the AWE’s sites at Burghfield and Aldermaston. This is in anticipation of Trident being renewed, even though Parliament will not make a decision on Trident renewal until 2016. Those arrested were Peter Chan from Reading and Jane Picksley from Herefordshire. They were taken into police custody. The people blocking the site are members of Action AWE and Trident Ploughshares. They are all committed to active nonviolence. They are calling on all parliamentary candidates to commit themselves to voting against Trident renewal. The Atomic Weapons Establishment (AWE) in Burghfield is operated by a consortium of Jacobs Engineering Group, Lockheed Martin and Serco. It plays an integral part in the final assembly and maintenance of nuclear warheads for use in the Trident system. In 2011 Peter Luff, the then Minister for Defence Equipment, announced £2 billion of spending for redevelopment of the Burghfield and Aldermaston weapons factories. The total spending on Weapons of Mass Destruction in the UK will soar to over £100bn should the government take the decision to renew Trident in 2016. The UK government has an armed nuclear submarine on patrol and ready to fire at all times, with the ability to wipe out cities almost anywhere on earth within 15 minutes. The UK government has a stockpile of around 225 nuclear warheads, each with eight times the explosive power of the bomb dropped on Hiroshima in 1945, that killed an estimated 140,000 to 200,000 people. Running the Trident nuclear weapons system currently costs £2 billion a year and has not seen any of the cutbacks facing other government spending and public services. The government will vote in 2016 to decide whether to invest in the UK’s Trident nuclear weapon system for another 30 years. Three autonomous groups set off from different parts of the country and arriving at 6.45 a.m. on Monday 9th June they locked on and phoned S, our press co-ordinator who sent out press releases. We had all arrived within 4 minutes of each other – an excellent bit of timing. person in London) know that we had completed the blockade. We were 9 people. was not business as usual. and in helping to negotiate the ending of the blockade 5 hours later. news that all construction deliveries had been stopped for the day – hurray. answers as to how protesters should deal with them. were going to concentrate on clearing one gate and leaving the other 2.
and was released. Both were out by about 6 p.m.
continue the resistance another day. has been charged (see above). 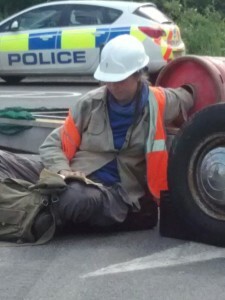 TWO people were arrested yesterday following a five-hour blockade of a nuclear site against further expansion of the plant. Protesters used two cars and a caravan to block the Atomic Weapons Establishment (AWE), which started at 7am yesterday. Around 30 people chained themselves to their cars and to each other, bringing traffic to a standstill. It effectively delayed construction work until the afternoon, when police forcefully removed vehicles from one of the site entrance roads. “We hope that it inspires others to take peaceful action to stop Trident renewal before 2016,” added Ms Brock. Nuclear programme Trident is bound to be reassessed in the year following the next general election. According to activists, direct action is “crucial” to stop an estimated £100 billion further government investment in the arms sector. Action AWE — a grassroots anti-nuclear campaign focusing on the weapon assembly factory in Burghfield, Berkshire — hosted the stunt. 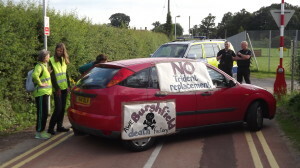 As reported by the Star, actions by anti-nuclear activists at Burghfield have escalated in recent months with the latest road block taking place just last May. Peter Chan from Reading and Jane Picksley from Herefordshire were arrested for obstructing the highway.